After seeing their babies languish in recent years as publicly traded companies, several company's founders are trying to buy back the businesses they launched. 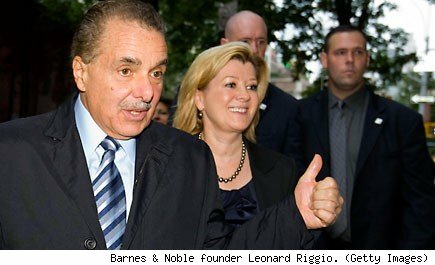 Barnes & Noble's (BKS) Leonard Riggio is the latest founder to make a move to privatize his ailing company. Riggio revealed on Monday that he wants to buy the company's flagship bookstores. If successful, Riggio -- who already owns roughly 30 percent of Barnes & Noble -- will acquire the namesake stores and the related BN.com website. The company's fledgling campus bookstore business and its Nook e-reader business would not be involved in the transaction. Riggio's plan puts him into an rarefied, but growing, club. Earlier this month, Michael Dell spearheaded a group of investors offering to take PC giant Dell (DELL) private. Late last year, it was Best Buy (BBY) founder Richard Schulze asking the consumer electronics retailer's board to consider his buyout offer. What will this mean for consumers if those three founders are successful? Can you really call a "do over" in corporate America? You won't find cheaper Dell laptops, price breaks on Best Buy HDMI cables, or deep discounts on Barnes & Noble paperbacks if these deals go through. Most consumers probably don't pay much attention to whether the companies they do business with are privately held or publicly traded. The competitive marketplace remains the same for both, so the retail prices a company charges are unlikely to move based on a change of ownership. The real differences here will be to the companies themselves. Privatization makes long-term planning easier. There's no longer the need to manage the company so it hits a certain sales or profit number every quarter. A company is freer to take chances -- and that's very important as Dell, Best Buy, and Barnes & Noble try to stage turnarounds. That may sound great, but there are a few downsides to being private. A public company can stage a secondary stock offering or introduce convertible bonds to line up new financing. A public company also generates a fair deal of publicity whenever it announces results or issues a press release. It isn't so easy to drum up attention as a privately held company. However, none of these three companies has much welcomed the publicity they've received lately. Sluggish PC sales in general have cast Dell in a negative light, and the digital media revolution has left many analysts skeptical about the long-term viability of both Best Buy and Barnes & Noble. Schulze was in a tight spot last year. The CEO he hand-selected was booted from Best Buy after having an inappropriate relationship with a coworker. When the directors found out that Schulze knew about it, but failed to inform them right away, they moved to oust him from the company's board. But it's hard to push out a founder with some serious skin in the game. Just as Riggio has a 30 percent stake in Barnes & Noble, and Dell still holds a chunk of his namesake computer empire, Schulze still owns 20 percent of Best Buy. So, taking over majority control would only require Schulze to find backers ready to help him acquire another 30 percent of the company. He's been in talks with private equity investors since last summer, but he has yet to make a formal offer. It won't be easy for Schulze. Sales have been sluggish as the retailer struggles to compete against online retailers with lower overhead. A recent policy move offering to match leading online retailers may help sales, but margins are going to get crushed. Analysts expect to hear that earnings fell sharply during the holiday quarter when Best Buy reports its results on Thursday. Riggio has a bigger chunk of Barnes & Noble, but the bookseller is in an even tighter spot. Barnes & Noble's holiday profits are shrinking and the quarterly losses it reports during the balance of the year are growing. Best Buy may sell washing machines at a time when you can't wash your clothes over the Internet, but Barnes & Noble sells books that are now being widely read on Kindles, iPads, and even the company's own Nook. It's not a business model with much of a future. Dell also has been yielding market share to the competition, though in this case, the real issue is that desktops and laptops are still Dell's bread and butter at a time when consumers are flocking to smartphones and tablets instead. Some investors think that Dell and his fellow investors are bidding too low for the company, though that won't be much of an argument if no one else offers a higher bid. Going private is the right approach when publicly traded life is getting ugly -- and that's exactly what's happening at Best Buy, Dell, and Barnes & Noble these days. Motley Fool contributor Rick Aristotle Munarriz has no position in any stocks mentioned. The Motley Fool has no position in any of the stocks mentioned. Try any of our newsletter services free for 30 days.